A parliamentary report of 1776-7 listed workhouses operating in Taunton St James (for up to 40 inmates), Taunton St Mary Magdalen (80), Bishop Hull (22), Lyddiard St Lawrence (16), and North Curry (20). Somerset: Angersleigh, Ash Priors, Bicknell [Bickenhall], Bishop's Hull (2), Bishop's Lydeard (2), Cheddon Fitzpaine, Churchstanton (from 1896), Combe Florey, Corfe, Cothelstone, Creech St. Michael (2), Curland, Durston, Halse, Hatch Beauchamp, Heathfield, Kingston, Lydeard St. Lawrence, North Curry, Norton Fitzwarren, Orchard Portman, Otterford, Pitminster (2), Riston or Ruishton, Stoke Fitzpaine, Staplegrove, Stoke St. Gregory (2), Stoke St Mary, Taunton—St James (3), Taunton—St Mary Magdalen (5), Thorn Falcon, Thurlbere [Thurlbear], Tolland, Trull, West Bagborough, West Hatch, West Monkton (2), Wilton. The population falling within the Union at the 1831 census had been 31,378 with parishes ranging in size from Angersleigh (population 54) to Taunton St Mary Magdalen (8,019). The average annual poor-rate expenditure for the period 1832-35 had been £17,158 or 10s.11d. per head of the population. 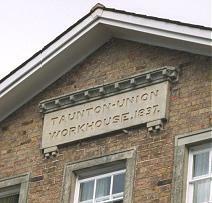 Taunton Union workhouse was erected 1836-8 on what is now Trinity Road in Taunton. The architect was Sampson Kempthorne and the design was based on his standard hexagonal plans for the Poor Law Commissioners. A two-storey infirmary block was later erected to the east of the main building, as shown on the 1912 OS map below. In 1849, there was an outbreak of cholera at the workhouse. 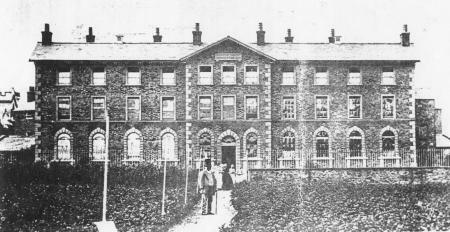 An investigation by Dr. Sutherland blamed factors such as the workhouse diet, ventilation, and cramped conditions although the Guardians denied responsibility for the problem. In Victorian times, the land to the south of the workhouse was open ground, as can be seen in the photograph below. The people in the picture may be the workhouse master and his family. Taunton entrance block from the south, 2000. © Somerset Archive and Record Office. From around 1912, the workhouse became Taunton Poor Law Institution, then from 1930 until 1948 was Taunton Public Assistance Institution. With the advent of the National Health Service in 1948, it became Trinity Hospital. 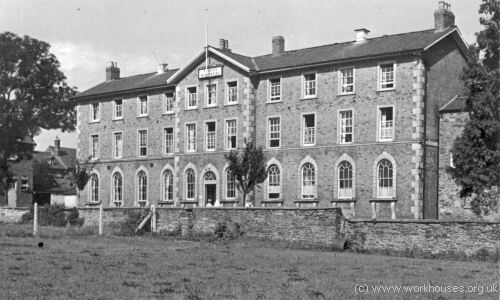 The majority of the former workhouse has been demolished. The entrance block has been refurbished as residential accommodation. Taunton entrance block from the south-east, 2000. 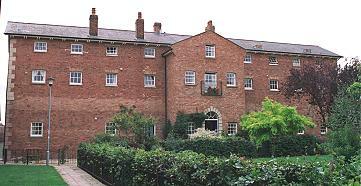 Taunton entrance block from the north, 2000. In 1912, the union converted a property referred to as 1-3 Portman Grove, Cheddon Road, for use as a children's home. In 1924, it could house 30 children and H. Webber was the home's Foster Father. The location is believed to be what is now 73-77 Cheddon Road. 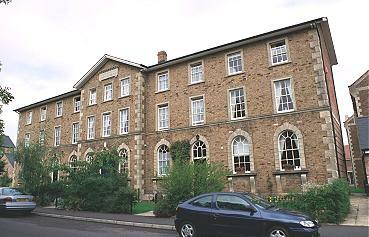 Former Taunton Union children's home, Cheddon Road, Taunton. Somerset Heritage Centre, Brunel Way, Langford Mead, Norton Fitzwarren, Taunton TA2 6SF. Substantial holdings include: Guardians' minute books (1836-1930); Admissions and discharges (1871-1930, with gaps); Casuals admissions and discharges (1910-30); Inmates' record cards (1912-30); Births (1836-1932); Deaths (1836-1937); Deaths of lunatics (1901-29); Register of applications and complaints by inmates (1913-36); Indoor relief lists (1866-1930); Creed register (1898-1926); etc.